Dragonbreath: Attack of the Ninja Frogs by Ursula Vernon is an incredibly quick MG read. Basically it’s about this dragon named Danny who has a BFF named Wendell. Danny is enamored by kung fu movies and ninjas. A new lizard, Suki, comes to town as part of an exchange program. Wendell gets a crush on Suki. Suki, however, is more than she appears, whether she likes it or not. 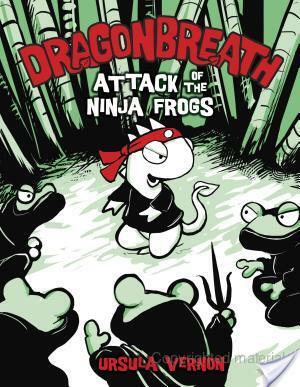 To be quite honest, I think Dragonbreath: Attack of the Ninja Frogs by Ursula Vernon would resonate well with kids who loved Diary of a Wimpy Kid, except for unlike Greg, Danny seems to really care about his friends. As an adult, I laughed out loud at one scene of the�Dragonbreath: Attack Of The Ninja Frogs by Ursula Vernon, where the great-grandfather dragon is meeting Wendell, and he keeps calling Wendell by the name of Wanda. I don’t know, I’m really 12 on the inside I swear, since I kept cracking up. Aside from that, I would probably have giggled at the other stuff, had I been a bit younger. While I didn’t exactly love Dragonbreath: Attack of the Ninja Frogs by Ursula Vernon, I do see it as being a wonderful book to push on the reluctant reading crowd. In fact, I plan on donating my copy to the middle school I student taught at, as I think some of the reluctant readers there would love it and I do think it would be a fabulous addition to an elementary/middle school library. I read this first one of these and passed it on to my younger niece – she loved it! I'll have to pick this one up for her. Thank you for participating in The Saturday Network!